The Ouberg Pass leading into the Tankwa Karoo. 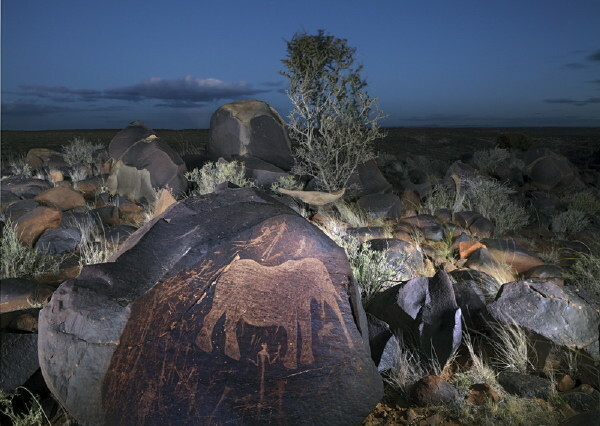 Hunting torches at twilight show up ancient Bushman petroglyphs ( or rock engravings ) on the Dolorite rock outcrops on the farm Grootspringbokoog in the northern Cape Karoo near Vanwyksdorp. 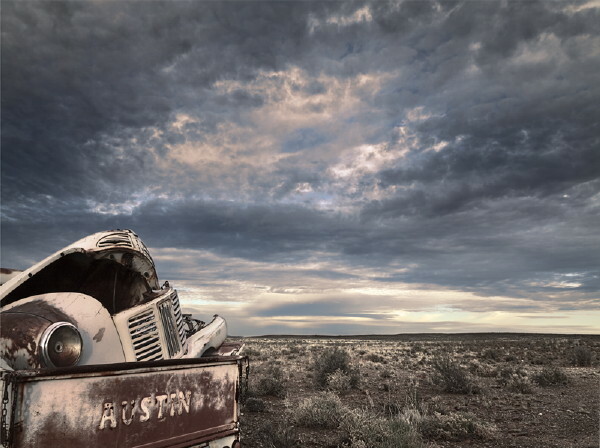 Two old Austins stand in a landscape north of the Karoo town of Williston in the Northern Cape. My hands are old now, but they have steered my bakkie and me over the gravel roads of the Karoo for more than 40 years. My book, Karoo: Long Time Passing, covers the most recent journeys of 2012, some five trips with my wife, Lynn, driving nearly 9,400 miles. Early morning stratus cloud form over the landscape on Benoudsfontein Farm, with its cement dam and sheep holding-pen. Northern Cape Karoo near Williston. 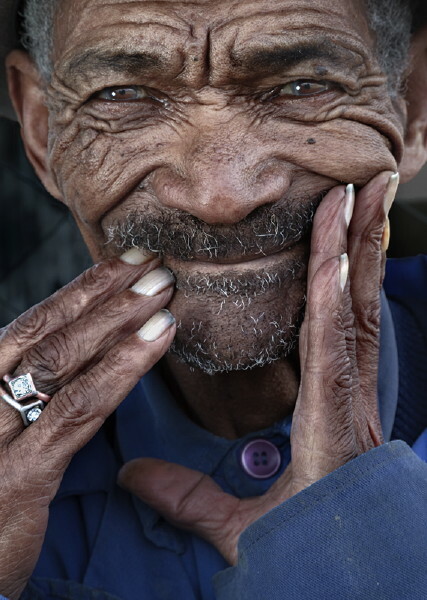 I am rewarded with a long smile when I ask 72 year old Appols van Wyk about the diamonds on his fingers. Appols works as a casual labourer in the town of Williston. 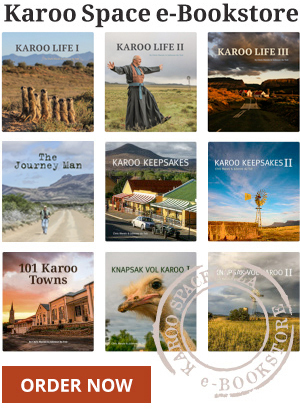 Karoo: Long Time Passing - published by Jacana – is on sale at leading bookshops. 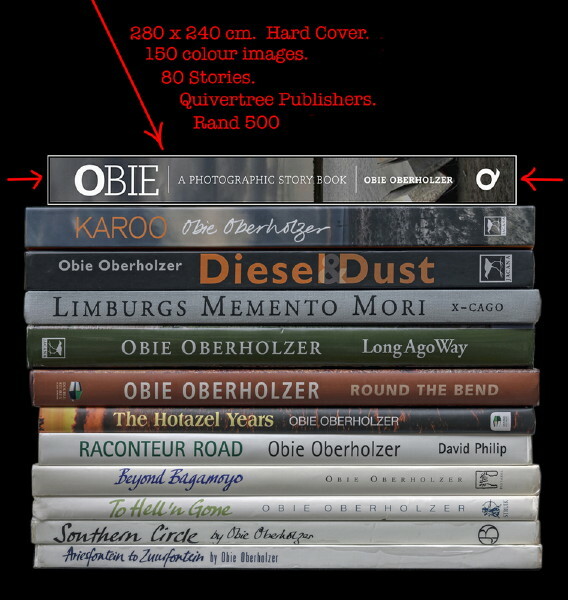 Oberholzer’s latest publication – Obie: A Photographic Storybook – has been published by Quivertree and is being launched in December 2016. 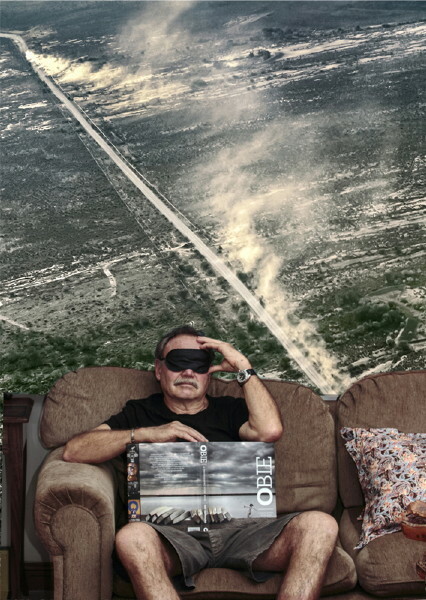 Collector’s items – including Obie’s latest book, Obie – A Photographic Storybook. 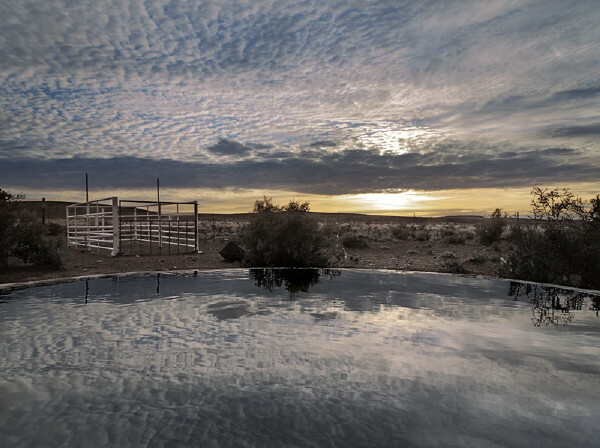 Take me there, Karoo Road, take me there. Behind me you wag your tail of dust and out past my window-arm you blur the bossies to a blended greenish grey. I hold you, I look you, I gravel you and I love you to a pale distant point. I have rolled tyres on you for forty years and still I thrill to ride your endless roughened way. Take me again and again to a place that becomes another space. Hell Boy, where is Taaiboschfontein se Leegte? You give me freedom, Karoo road, freedom. Along you, I make photo songs, often just a few and sometimes a couple more. I can never pass you by; your long way connects the landscapes in my mind. 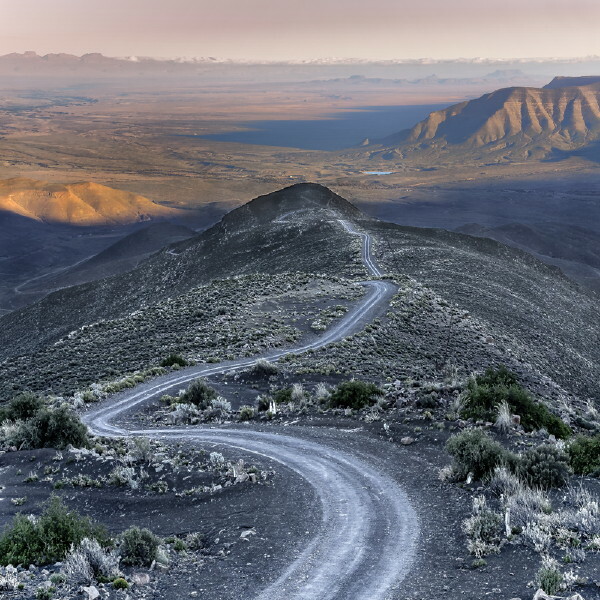 One day, when the body is too frail to change gears through your driffies and curves and passes, I will sit and dream you Karoo road, dream you. I watch the windmills pass, sheep look up, crows sit on poles, a row of ridges on the right, two, four, five koppies lie up ahead’ a cracked dam, a lonely farm house and in front, an old sign, with bullet holes, that reads —-‘Merweville 30’ Lead me on, Great Karoo road, lead me on.